SAN BERNARDINO, Calif. – (May 25, 2011) – The beautiful sunny and clear California weather didn’t disappoint this weekend, and neither did the action-packed Round 5 and 6 races of the Lucas Oil Off-Road Racing Series at Glen Helen Raceway May 21 and 22. 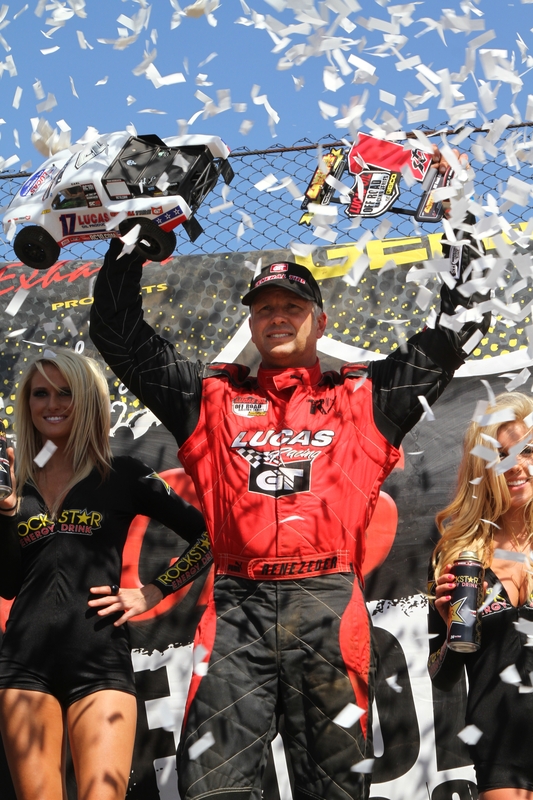 Team General Tire’s Carl Renezeder stormed the podium, taking first in Pro 2 and Pro 4 Saturday, followed by first in Pro 2 and second in Pro 4 Sunday. GT’s young gun, Dawson Kirchner, stole first in the Round 6 Superlite race Sunday. Renezeder hit the track following a beautiful opening ceremony dedicated to teammate Jeff “Ox” Kargola, who passed away in a tragic motorcycle accident in Baja April 29. Team GT honored Jeff with a sky writing that read “We love u Ox,” followed by a tribute video and dove release. A special Superlite truck driven by Jeff’s close friend, Trigger Gumm, and numbered “0x” raced in his honor, bearing only Ox logos. At the Pro 4 Unlimited race Saturday, the fastest class of the day, Renezeder started at the back of the pack and was forced wide, nearly pushing him outside the k-rail and landing him in last position on the track. After turn one, Renezeder amped up his speed to take fifth place. Quickly and steadily, Renezeder began knocking off the leading drivers, moving up to first place and holding his position for the win. Renezeder’s luck wasn’t over yet. At the last race of the day, Pro 2 Unlimited, Renezeder started on the front row. Despite accidents, mishaps and vehicle fires, Renezeder emerged from the chaotic race unscathed to take first and his second win of the day. During Sunday’s Round 6 event, Renezeder unleashed his fury once more, again taking first in Pro 2 and earning second on the podium in Pro 4. Team GT driver and the race’s youngest competitor at just 18 years old, Dawson Kirchner, stole a first-place victory at Sunday’s Superlite race.